For the 6th time since 1990, the British football team has been knocked out of a major tournament by losing the decisive penalty shootout. In the quarter-finals of Euro 2012 against Italy last Sunday, England seemed to finally put an end to a long line of shootout woe after the Italian Riccardo Montolivo was the first to miss. But in the end, Sunday’s match only validated their misery as they were defeated by Italy with a 4-2 final score. A penalty shootout is for most soccer fans – and football players – the most nerve-racking part of a football game. After a 120 minute draw, five players of each team get the chance to turn the game into victory.Whichever team scores more goals wins. Some say it’s a matter of chance who wins, and that penalty kicks cannot be practiced. 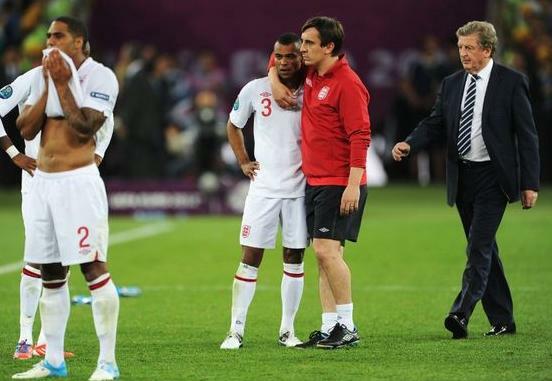 This assumption was confirmed by the coach of the British team Roy Hodgson who said – after losing the shootout – that “it was Italy that took the chance” and that penalties cannot be practiced, because there’s no way to simulate the tiredness, the pressure and the tension of an important match during training. Source: United Academics Magazine. For the whole article click here. “Penalties can absolutely be practiced during training. Of course, you cannot reproduce the pressure of major tournaments, but that doesn’t mean you cannot prepare yourself for it as a player,” says Dr. Gert-Jan Pepping, Sport Scientist and lecturer in Human Movement Sciences at the University of Groningen, the Netherlands. Researchers studied a large number of penalty-shootouts during important soccer matches, as long as the score in the shootout was still equal. It turned out that players who after scoring overtly celebrated in the direction and with their teammates were more likely to win the game. In addition, cheering had the opposite effect on the other team. When they watched a team sharing happiness with the hands up in the air, the pressure and anxiety only increased in the opponents. As a consequence, it was more than twice as likely for the next opponent to miss his penalty. This study demonstrates that beside practicing aiming – and shooting strategies, training should also focus on increasing players’ insights in how emotions – positive or negative – can influence their own performance as well as that of the whole team and the opponent team. “Football players should be aware of the psychological processes that are important during a game and act on it,” says Pepping. Overall we can draw the conclusion that in the future , the coach of the British football team may do good by reading some more studies prior to the next major tournament instead of resigning himself to the widespread belief that penalty kicks cannot be trained. Of course, the high pressure of a football penalty shootout is impossible to reproduce during a training, but research proves that there are ways in which players can prepare themselves for this. England, it’s time to practice on skills, positive thinking and emotional control. So hopefully next time, you can put an end to this shootout nightmare. United Academics Magazine (Carian Thus). For the whole article click here. Just have to keep on putting themselves in the situation, and some time they are going to win!